We all know this experience. You go to the car wash. You pay for a nice shine. You vacuum the seats and floors. And after a month, not only has the shine faded, but it looks like a dump on the inside. Follow these tips to maintain a clean interior throughout the winter. This idea might seem unappealing at first. Who wants a trash container to take up legroom in the car? And won’t it smell? But, especially if you don’t want to clean out your car every time you drive it, a secondary benefit of a trash can is to get you in the habit of cleaning out your car. Even if it means just taking out the trash once a month. But obviously the primary benefit of having a trash can in your car is it eliminates the garbage. And it won’t take up too much space. Buy a small 3 or 5 gallon trash can with a lid. Once you get in the habit of taking the trash out of the car, you can get rid of the trash can. Invest in a good car organizer. Then purchase some car wipes to keep the interior shiny and clean. Also stock up on some baby wipes for any messy passengers. Place these cleaners and any objects or tools in the organizer. With the trashcan and organizer, what else can be in your car? 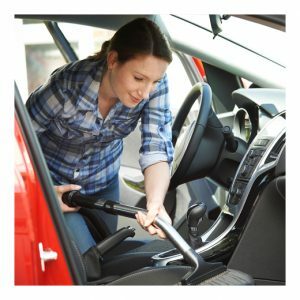 Once you get organized, cleaning will be the easiest part of owning a car. Even if you have a family, an organizing box will hold toys, crayons, books, and anything else you’ll need. Now that the floor is clean and the dashboard wiped, the interior of your car will stay as clean as it came out of the factory. Do business at the time that is best for you with our 24-hour rental/payment center available on site!